The April 2011 edition of Ensign magazine includes an article about early Latter-day Saint Rebecca Swain Williams. As the article notes, Rebecca and her husband, Fredrick G. Williams, converted to the LDS Church in late 1830 while living in Kirtland, Ohio. Back in New York, Rebecca’s father opposed her conversion to Mormonism. This caused a deep and lasting division in the Swain family. Nevertheless, Rebecca remained faithful to the LDS Church until her death in 1861. She was never reconciled to her non-LDS family. The history of Rebecca Swain provided in the Ensign is somewhat incomplete. Though the article follows her life beyond the death of her husband in 1842 as it reports her relocation to Utah (in 1848-49), her obedience to Brigham Young’s call to settle then-remote Cache Valley, Utah in 1860, and her death in Smithfield, Utah in 1861, it fails to mention Rebecca’s marriage to Heber C. Kimball in 1846. 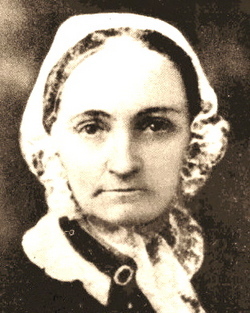 Rebecca Swain Williams became the nineteenth (or twentieth) plural wife of Heber C. Kimball (for time only) on February 7, 1846 in the Nauvoo Temple. Her place in the list of Heber’s wives is questionable because Heber also married Sarah Shuler the same day. When she married Heber C. Kimball, Rebecca had the dubious honor of becoming a member of a family that held 2nd place in two categories. With 37 total wives during the Nauvoo years (1841-1846), the Kimball family was second only to the Brigham Young family (that included 40 plural wives). For the Utah years, the Kimball family was again just behind the Young family with 44 and 55 wives respectively. But in one category, Rebecca’s new family took 1st place. Heber C. Kimball married five pairs of sisters while Brigham Young only married four pairs (George D. Smith, Nauvoo Polygamy, 287-288). The Ensign article praises Rebecca’s tenacity, mentioning that she drove her own wagon west to Utah, took charge of a farm on Mill Creek, and again drove her own wagon when she relocated to help settle Cache Valley. As one of 44 wives, it’s not surprising that she received no help from her husband. But what’s interesting (though also not surprising) is that nowhere in the retelling of any of this is Rebecca’s status as a plural wife of an apostle and member of the Church’s First Presidency disclosed. Surely, in an article intended to highlight the “steadfast & immovable” faith of an early convert to the Church, Rebecca’s willingness to live The Principle is an important aspect of her history that shouldn’t be neglected. This entry was posted in Mormon History, Polygamy and tagged Fredrick G. Williams, Heber C. Kimball, Polygamy, Rebecca Swain Williams. Bookmark the permalink. as being good counsel . Gay marriage, really ? My friend you need Jesus in a massive way ! Mikey. I'm confused. You want fair and balanced. Read this site, then go to lds.org, then read an article on this site, then go to lds.org. If I read lds.org, I would probably say the same thing. They are not fair and balanced either. I would love for the whole truth to be told. That would be great!!! It will never happen though, because for the LDS church to come clean about all of it would be the downfall of their organization. There are so many mormons out there that have been told some of this truth about the doctrines and history and they don't believe it. They call it anti! Stuff made up to make the church look bad and the leaders are all too happy to let them continue believing that. Can't lose that tithing money. Falcon is right, Jesus didn't die to give us a legalistic religion, He died to give us eternal life. and sprightly . Why is this? Because God loves that man, and because he honors his work and word." [ Discourse by Herber C. Kimball, Deseret News, 4-6-1857 ] . Sadly, Mormons embrace this counsel. Mikey, I love how you dont want to debate doctrine, You just showed how biblical you really are. You have no love for the lost and only want your itching ears tickled, You choose not to debate because you have nothing to say so you would rather believe what you want over the truth. That is so crazy! I'm embarrassed to say that I used to be one of the mindless, just follow along, it's all too involved and I just need to follow the prophet and have faith as a little child. I think there are a lot of mormons like I used to be. Just love the warm and fuzzy stuff and don't worry about how it all works. These people don't know Jesus or what he said ( neither did I). company, you sin if you do, and you will be damned and go to hell. What do you think of such people? Doctrine is the best part. We all know mormons lead wonderful lives. Its the doctrine and theology that is different and interesting. Found extremely positive aspect to mormonism. LDS women's blogs. Your wife might like this one. (I like balancing everything, life as lou and especially this one http://www.theredheadedhostess.com/?p=838 . Congratulations on your new baby and your two sons. I have an eleven year old son, and an eight year old son too! My mormon neighbors are better people than I will ever be, but that won't get them, or anyone into heaven. If only the good make it to Heaven, God wouldn't have to send his son Jesus. He could have made a list and checked it twice, but the bible does not keep a record of our sins. We love because He loved us. We love our neighbor because we reflect the Love of God. No rules, because if we cannot keep part of the Law, we break the Whole Law. That is why we need Jesus. WOW! And this was all revealed to them by God as the restoration of the Gospel. Ah, but it doesn't count because it happened a long time ago and is, after all, NOT faith promoting. Mormons are so fond of telling us that the restored gospel contains so many wonderful and beautiful things. Like what? Is this one of them. It looks to me like modern Mormons are really missing the boat on this terrific stuff that their early Mormon brethren were in to. But alas, it has all disappeared because of brand new, improved, super duper revelation. What else might we be expecting might disappear? Could men becoming gods disappear by new revelation? Could forever families disappear because of new revelation? How about wearing "sacred" under garments? About the only thing disappearing from Mormonism today are all of the people who were former Mormons and who have figured out that the restored gospel is a rip-off, a sham and while having sweet sounding language is merely away of enslaving folks to a form of religion that has no power to provide for them eternal life. Apparently science agrees in part with this sentiment too WW. This shows that men in polygamous marriages live longer, healthier and younger life styles thn those who are in a monogamous marriage. Although they do not contribute this to God. be consistant and embrace Adam as the god who sexually fathered Jesus?